I hardly ever use recipes from the internet, least of all from unknown food bloggers (of whom there seem to be a few million). Usually I spend hours, days even, researching the thing I want to make in various books and then come up with a hybrid recipe that, for me, takes the best of each. 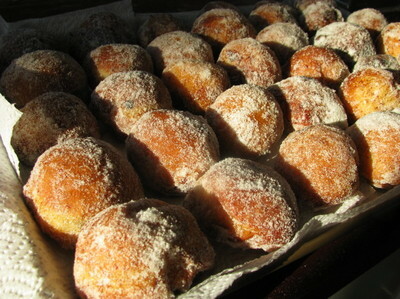 But these Polish doughnuts are an exception. With barely a thought (OK, I did check in a few books, very quickly) I followed this recipe from the For the Body and Soul blog pretty much exactly and it worked so well I’ve barely tweaked it. So thank you Karolcia (from Poland, studying in Canada). My aim was to recreate the light, puffy, too-easy-to-eat doughnuts we’d had at Cukiernia Samanta – a fantastic bakery in Zakopane, Poland where they make literally millions of doughnuts, especially in time for Fat Thursday (at the start of Lent) when all of Poland goes doughnut crazy. 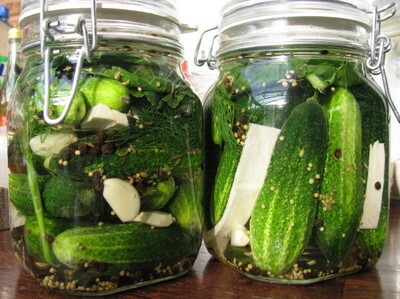 We begged for their recipe, but it is a closely guarded family secret. After many hours of mixing, kneading, resting, shaping and frying this beautiful enriched dough, I succeeded. My note to self for next time is to let the dough rise (more slowly) in the fridge as it would be easier to roll and shape when cold. 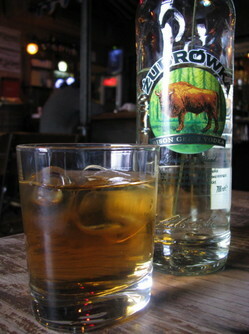 Żubrówka (aka bison grass vodka), made in Poland since the 16th century or earlier, is said to boost manliness, stamina and sexual drive. This is because it’s infused with the grass which the bison of Białowieża forest in Poland love to eat. These ancient bison are so fond of this special grass that attempts to transplant them to other parts of Europe have failed due to the absence of the grass. Every bottle of Żubrówka contains one stem of the grass.